Can anyone tell me what the correct Japanese text is for Naihanchi please? I've been told that kanji should be used for pronouns, but I've also read that Naihanchi is only ever written in katakana. Regarding which is right I honestly can't comment, however the text i have used in my syllabus is: ????? I know this isn't a direct answer to your question but hope it helps a little. Naihanchi is written in katakana because it is not a japanese term. I'm not sure but I think there are at least three ways to write Naihanchi with Kanji and then there are all the other forms of spelling Naifanchi etc.. When you take a look at Wikipedia Sensei http://de.wikipedia.org/wiki/Naihanchi you have the katakana and one kanji example. I would post it here but like in Andy's post they always getting scrambled. It's possible that the representations in kanji may be post hoc attempts at constructing the name. The characters spelling "hanchi/hanchin" in the first of the two examples on that wikipedia page mean "step + progress" and in the other they refer to "the land between rice paddy fields + war". The latter is obviously the origin of the myth that these kata were designed for fighting on the walkways between paddy fields. "Nai" means "inner". Perhaps nobody actually knows (any more) how to write the word in its original form. It's possible that the representations in kanji may be post hoc attempts at constructing the name. I totally agree. As a non-Japanese word, it would be correct to write “Naihanchi” in katakana (One of the three types of Japanese script. Katakana shows sounds but not meaning). To my knowledge every written example we have for “Naihanchi” is in katakana. To ascertain what the meaning was we would need the word written in kanji (“Chinese” characters), but we don’t have that. All we have are modern attempts to reconstruct it by using kanji that COULD make the associated sounds. These are all “educated guesses” though and unlikely to be correct. The bottom line is that no one definitely knows what “Naihanchi” actually means. Could be fun to explore some of the possible meanings are part of this thread? As I say, we’ll never know for certain. However, it could be interesting to explore the possibilities? "The temptation to write the Okinawan term naihanchi in Chinese characters in Japanese text is strong because nai, han, and chi all sound like Japanese readings for Chinese characters. However, according to Sakihara's Okinawan dictionary, the word is actually cognate to native Japanese nari (ringing?) + hajiki (snap). "In theory one could Japanize the term as narihajiki and spell it as something like ???? using mixed Chinese character/hiragana script (Chinese characters for roots and hiragana for endings, roughly speaking), but since the word is non-Japanese, I agree with Abernethy: it should be written in katakana, a script reserved for borrowings from languages other than classical Chinese. The Japanese Wikipedia uses the katakana spelling ?????? naifanchi with -f- reflecting a more conservative Okinawan pronuncation. "There are multiple Okinawan nai, and I'm not sure which one is in naihanchi. I'm assuming it's the nai as in kannai 'thunder', literally 'god-ringing', rather than nai 'personal appearance, dress' or nai 'fruit'. "Okinawan lost -r- between a and i: nai is from nari. "Okinawan shifted an earlier fanjiki to fanchi and then hanchi. "Latin civitas > Italian città 'city'"
Overall, he's confident about "hanchi" equalling "snap." However, he's less confident on the "nai." His best guess would be "ringing." So, perhaps Naihanchi means "ringing snap"? That’s a really interesting post! Thanks for sharing that. Very interesting to explore the various possibilities! I'm a long-time fan of your work! My own view on this subject is that Ockham's razor should apply. I know that lots of folks don't perform naihanchi in a "horse stance", preferring a high, narrow stance more akin to heiko dachi. But my own view is that it is a kata that is firmly rooted in "mabu" - horse stance. The Chinese mabu is somewhat narrower than the kiba dachi of today's karate (in particular that used in shotokan variety) so it is not all that different from what folks might call "naihanchi dachi" in karate. This stance (mabu) is very common in both external and internal forms of quan fa. So if naihanchi is derived from, or even just influenced by, Chinese martial tradition, it strikes me as unsurprising that it would retain "mabu" (even if it is slightly narrower in many karate styles today). And I believe that, if anything, it is the stance that characterises naihanchi kata (in much the same way as the sanchin dachi dominates sanchin kata - whether you are in southern China (where the sanzhan stance - also known as "zhan bu" / "chien be") or in Okinawa). "Mabu" (literally "horse step") can be pronounced "mafu" or "maho". It strikes me that there is more than a mere coincidence that naihanchi is also called "naihanchin" and "naifunchin/naifuanchin". Both could clearly be derivatives/corruptions of the Chinese characters "mafuchin" or "mahochin". "M" and "N" are, after all, very similar sounding. Accordingly I adhere strongly to the view that the original characters for naihanchi were the characters that spell (in Chinese) "mabuchin" (Amoy/Hokkien) or "mabuzhan" (Mandarin) - namely "battle in horse step". Southern Chinese form naming conventions in the late 1800s really weren't all that florid; rather they were quite functional (naming kata by reference to the number of steps, etc.). I can't see why this would not be the case in the transfer of such kata to Okinawa which was similarly pragmatic. Bear in mind that "steps" (ie. number, stance etc.) are a central theme to Chinese forms and their Okinawan counterparts (eg. happoren/babulian, ershiba/nepai, etc.). I expand on my argument in this blog entry from years gone by: http://dandjurdjevic.blogspot.com/2008/05/naming-of-naihanchi-naifuanchi-or.html. All the best and keep up the good work! Im no expert in this area, and just used the resources avalaible to me, but the characters matched and the translation for each from a non karate based translation site, and I treble checked them with other translation sites, direct to the characters Nagamine used in his book. Sorry I can't be more specific with sources just now, I have my notes somewhere at home and will dig them out and share. NOTE I had the good fortune to lunch again with my friend Tom Sensei from Kodo Ryu, and I can confirm I have no idea of the change of meaning when the single characters I translated are combined, as they are written - this is significant, but the basic translation served it's purpose for me. Got to this thread rather late it seems but I was asked the same question by Lee via private message so I shall put my response here for everyone to see. Basically it is possible to write every word in the Japanese language in any of the three scripts (hiragana, katakana and kanji) although there is always an "officialy accepted" way each one is written. If a word originated in Chinese then it will usually be written in kanji, as will many native Japanese nouns, verbs and adjectives that have had kanji assigned to them. Katakana is primarily used for loan words from other non kanji using languages (basically anything other than Chinese, korean or the old okinawan languages). Hiragana is for very old native words, words that were never assigned kanji when they were introduced to the language and all other gramattical words and functions. Of course these conventions are often played around with for effect, much like writing in italics or capitals or using alternative spellings in English. In the case of nihanchi and the majority of the other karate kata names they originated on Okinawa and are thought to be a mish mash of Chinese and Okinawan dialects. They would most likely have originally been written with kanji but for a very long time were only passed down orally and so the exact characters used have been lost, which is why they are now most often treated as loan words from a non-kanji using language and thus written in katakana. There are many theories as to what the original kanji used were from various karate researchers, historians and linguists but as there is no evidence to confirm any of them they remain just theories. This can bee seen in other kata names too such as the goju ryu lineage "seiunchin" which in the original was apparently closer to "Seiyuenchin". I can't help but think that these kanji are misconceived: If a name like naihanchi is, as I suspect, a corruption of some Chinese name, then clearly shouldn't make any sense (otherwise it wouldn't be a corruption!). It will be an "Okinawanised' corruption, meaning that some kanji are likely to fit it, using Okinawan or Japanese pronunciation. However that kanji will be largely meaningless - which is what you get with "inner", "stagger sideways" (the sideways bit sounds promising, but "stagger"?) and "Earth" (the latter sounds promising too, but the reality here is that the character for "Earth" does not have the same connotations that we might ascribe to it in English). Rather, if you examine kata names such as "sanchin", seiunchin", "shisochin" etc. you see that "chin" (zhan) is fairly common in kata descended from China. In southern China "chin" is often used in kata names (it means "battle"). There are many sources that point to the kata being referred to as "naifuanchin" or something similar. Accordingly, I think the "chi" is a red herring - as is any reference to "inner" (as if the 'nami ashi' - which uses the inner part of the leg - is really the defining characteristic of the kata!) or any reference to "staggering" - be it sideways or in any direction. The first is used by Mabuni and roughly means "walk with inward steps". Number 2 is used by Nagamine Shoshin and roughly means Ground between the Ankles. Number 3 is used in Wado circles and means "battle between lynchets". Number 4 is from China and means "battle between sails". And the last is used e.g. by Gensei Ryu people and means nothing that makes sense to me. I hate to say it Holger, but even the first 3 make little sense - especially when you look at naihanchi. And again, I wouldn't be looking at kanji that match exactly how naihanchi is pronounced today. I strongly suspect that naihanchi is a name that was originally Chinese (otherwise we would have more certain kanji). Most karate kata that have Chinese names (eg. seipai) are actually Okinawan approximations of Amoy/Hokkien. Pronounced in Hogen or mainland Japanese the kanji are pronounced very differently - as they are in southern China. When you combine "Chinese whispers" and the passing of ages, I doubt you can rely upon any "match" of kanji to what we call "naihanchi" today. If "incomplete/uncertain memory" weren't a factor, then we would have the kanji (as we do for many other kata). We certainly wouldn't have multiple names (naihanchi, naihanchin, naifuanchin, naifunchin, naifanchin etc.). In my personal (and professional) opinion, all of the combinations used here look very much like characters assigned to the name to give it a desired meaning (known technically as ateji). That does not mean that any of them could not possibly be the original but I would doubt it. Nagamine's rendering is very forced as the character "han" here is an obscure one meaning the paw of an animal and I have never seen it used outside of one passage in a single very old text (the Shunshu Sashiden from 765 that is actually a translation from Chinese itself if anyone cares). To interpret it as human feet is stretching the original meaning way too far in my opinion. The third and fourth options here are clearly put together to support an inferred interpretation of the kata as "fighting on the walkways between paddy fields" and "fighting on a boat" (which we all know are laughable). The gensei ryu version is interesting (and would mean something like "standing firm within an area") but again it is almost certianly a modern invention. It fits the pronunciation in standard Japanese far too closely while still being rather too abstract and awkward. No problem Dan. 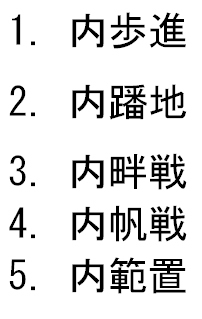 I just wanted to show the different kanji that are used by some people. As I pointed out in my first post in this thread, I prefer to use Katagana like Funakoshi and Motobu used which are read as Naihanchi. As Gavin pointed out the Kanji that are used here and there are Ateji that sound roughly like naihanchi, naihanchin, naifuanchin, naifunchin, naifanchin whatever. That is why I am glad that Funakoshi releaved the whole issue when calling Naihanchi Kibadachi-Gata and later Tekki-Gata. Though I find your theory very interesting, I'll stick to Katagana. @Gavin: Thanks for the translation and pardon mine, but I am no pro . Personally I felt Nagamine Sensei use of particular kanji as shown in his book, was a significant enough Okinawan reference to work from, as the kata is Okinawan, he is Okinawan and was a significant Master of a significant Ryu - as a strong side note im also told he was an intellegent, educated man with a significant cultural interest and experience. Of course it would be an Okinawan presentation (ie not Chinese), albeit a mainland influenced one (However even with my very limited ability in such things, I still found the exact characters, with clear translations). Im not sure why that would be a problem, considering the context of what were discussing. I do see your points in relation to the english translation as being open, but taken literally I felt very comftorable with those words in realtion to Naihanchi Kata,as we practice it - and theres no reason it would be to specific, why would it as it's just a name for a kata. This is worth investigating further IMO, and theres been some great input from different people, good stuff. I will get the characters uploaded, and try and find my notes - this way vastly better resourced people can look at it and lets see what comes out. I tend to agree with Mr. Djurdjevic on this one. I think that it was a chinese word and then as time went by, the word was lost to it's original meaning. Most of the attempts I have read to put a meaning to it are more of a reverse engineering trying to find sounds/words that might describe the kata. I think Naihanchi ranks up there with Wansu/Chinto/Kusanku in that we will never have a direct meaning to it. And could have even been the name of someone/place where it was learned.